Sometimes I’ll see a recipe and think, “damn, I need that NOW!” Or at least, SOON. 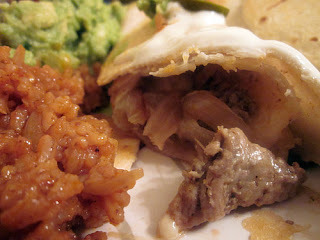 Such was the case when I saw this recipe from Pam at For the Love of Cooking yesterday. I already had all the ingredients so it was easy enough to satisfy my craving ASAP. The onions and cheese were a perfect compliment to the pork. SO good! Thanks again, Pam! Heat oil in a medium size pot over medium heat, then add rice. Season with salt, cumin and garlic powder and stir constantly. Once rice browns, add onion, and cook until translucent. Add tomato sauce and chicken broth, and more spices to taste. Bring to a boil, then turn heat down to low and cover. Cook for about 20 minutes, or until all liquid is absorbed. Sprinkle cilantro over rice and serve. 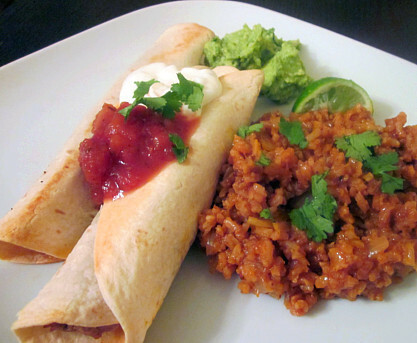 This entry was posted in avocado, main dishes, make ahead, Mexican, pork, rice, side dishes. Bookmark the permalink. Melissa, this looks really great. Nice picture, too! I am a sucker for Mexican. This looks like a perfect meal.